Funeral Directors and Embalmers are required to complete 12 hours of continuing education every 2 years. The deadline is every odd year on December 31st. The District of Columbia Board of Funeral Directors accepts courses approved by the Academy of Professional Funeral Service Practice (APFSP) for continuing education credit. 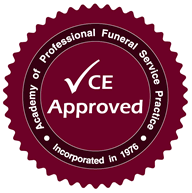 Funeral Service Academy is approved by the APFSP.